Astronomers probing the deepest mysteries of the universe are getting help from "zombie" stars, dead white dwarfs that come back to life in huge explosions. The cosmic zombies are officially known as Type Ia supernovas, and they're helping scientists study dark energy— the mysterious stuff thought to make up three-quarters of the universe, and to be responsible for its accelerating expansion. Supernovas are stellar explosions, and they've been observed since at least 1054 A.D., when an exploded star formed what we know today as the Crab Nebula. Type Ia supernovas are a distinct class that originate in binary star systems. At least one of the two stars in such a system is a white dwarf — a tiny, super-dense star that has ceased undergoing nuclear fusion reactions. "That's what our sun will be at the end of its life," Howell said. "It will have the mass of the sun crammed into the size of the Earth." These blasts are incredibly luminous, often blazing up with the light of one billion suns, Howell said. And they're consistent enough that astrophysicists use them as "standard candles" for measuring distances in the universe. The study of Type Ia supernovas led scientists to propose the existence of dark energy about 20 years ago, Howell said. "What we've found is that the universe hasn't been expanding at the same rate," Howell said. "And it hasn't been slowing down as everyone thought it would be, due to gravity. Instead, it has been speeding up. There's a force that counteracts gravity, and we don't know what it is. We call it dark energy." Dark energy is likely a property of space, Howell said. And continuing to study Type Ia supernovas may help researchers get a better handle on just what the stuff is. "Space itself has some energy associated with it," Howell said. "That's what the results seem to indicate, that dark energy is distributed everywhere in space. It looks like it's a property of the vacuum, but we're not completely sure. 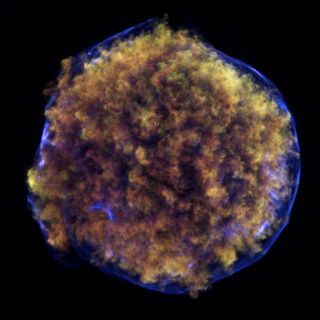 We're trying to figure out how sure we are of that –– and if we can improve Type Ia supernovae as standard candles, we can make our measurements better." Throughout history, people have noticed a few supernovas so bright they could be seen with the naked eye, such as the famous 1054 supernova. With modern telescopes, astronomers have discovered supernovas farther away, and the instruments just keep getting better and better. So a breakthrough may well be on the horizon. "The next decade holds real promise of making serious progress in the understanding of nearly every aspect of supernovae Ia, from their explosion physics, to their progenitors, to their use as standard candles," Howell wrote in the review article. "And with this knowledge may come the key to unlocking the darkest secrets of dark energy."